URL Manager Pro and Safari (and Firefox)? Safari's Debug menu and the Diamond menu? What about auto-starting URL Manager Pro? Can I use URL Manager Pro to come up with one set of Bookmarks/Favorites/History files? URL Manager Pro looks fully compatible with macOS Mojave (10.14). You will need to be aware of the following though. URL Manager Pro is fully compatible with macOS High Sierra (10.13). You will need URL Manager Pro 4.6. URL Manager Pro 4.4 supports Retina Displays. Please update to OS X 10.8.3. On this system, please download URL Manager Pro 4.3 or higher. You can upgrade from version URL Manager Pro 3.x to 4.x for 14.95 USD or 14.95 EUR. You can purchase an URL Manager Pro Upgrade via PayPal and eSellerate (see the links on the home page). Available now from the Mac App Store : URL Manager Pro 4.1. This is the Intel version of URL Manager Pro. It runs on Mountain Lion, Lion, Snow Leopard and Leopard. You can also download and purchase from my web site (preferred). Please use URL Manager Pro 4.0 (Intel), see above. Please read : how to bookmark in Firefox or Opera. Unfortunately, because Firefox stores its bookmarks in a MySQL database, UMP cannot directly access it. Please use the following workaround. In Firefox, choose Show All Bookmarks from the Bookmarks menu. At the top of the window are several toolbar buttons. Use the last one and select Export Bookmarks to HTML from the popup menu. Now, in URL Manager Pro, use File menu->Import->Import Bookmarks to import the file. URL Manager Pro is compatible with Leopard Mac OS X 10.5. URL Manager Pro 3.5 is currently in beta and the Release Notes are available. Before installing Leopard, please also deinstall APE (Application Enhancer). The Spotlight importer for URL Manager Pro is finished. The Spotlight importer is a Universal Binary and runs native on Intel Macs. Secondly, a bug now seems to appear when registering URL Manager Pro on Mac OS X 10.4.8 on Intel Macs. Please use the 3.5 beta version which is mentioned above this paragraph. URL Manager Pro 3.4 runs fine in Rosetta on Intel Macs. Some components already run native on Intel Macs, like the Spotlight importer and the new Add Bookmark plug-in. Somewhere this year, the URL Manager Pro main application will also be a Universal Binary. URL Manager Pro 3.4.4 does not run correctly on Mac OS X 10.2.8 (the menu extra does not show). Please download URL Manager Pro 3.4.5. Camino changed its creator type and there were some compatibility problems between Camino 1.0a and URL Manager Pro. Please download URL Manager Pro 3.4.4, which should fix these problems. There were two small bugs on Tiger. One is in the note section of the Get Info Window, which makes it difficult to edit a note and bugs in the Search Drawer. URL Manager Pro 3.4.4 fixes these bugs. URL Manager Pro is fully compatible with Tiger. As you know, I prefer you use the new Bookmark Menu Extra instead of the antique Shared Menus feature of URL Manager Pro. However, might you still be addicted to the Shared Menus feature: for Tiger you need to install the new Shared Menus Enhancer 1.3. Mondriaan 1.3 has been released for Tiger. The APE module Menu Master was not compatible with URL Manager Pro. The latest version of Menu Master (1.2) should fix this problem. The solution for Menu Master versions lower than 1.2: please add URL Manager Pro to Menu Master's 'excluded applications' list. 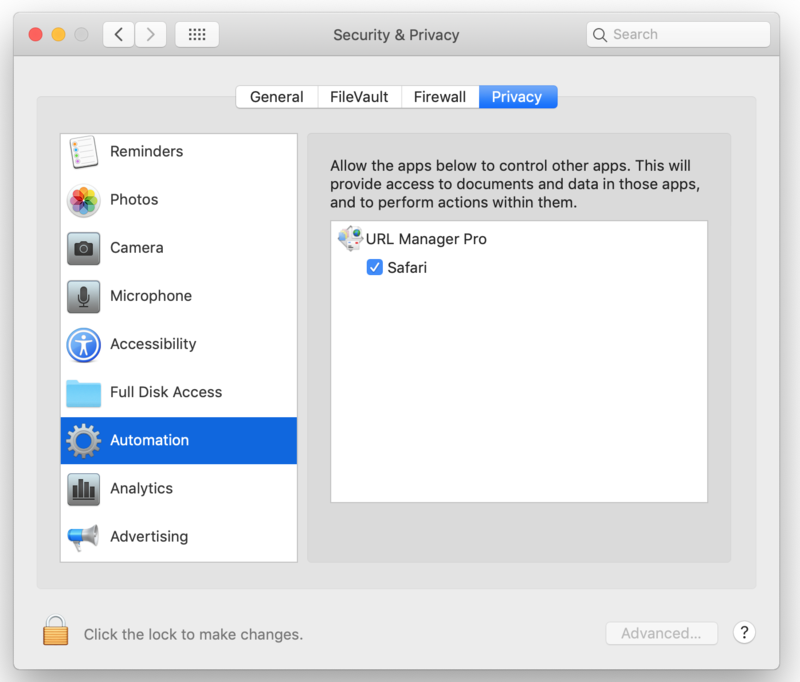 URL Manager Pro and Safari, Shiira, Firefox, Mozilla or Netscape? Please use the Bookmark Menu Extra of URL Manager Pro with these browsers. Enable it via Preferences/Menu Extra. URL Manager Pro 3.1 (Mac OS X) added Shared Menus support to Apple's Safari via the Shared Menus Enhancer (see below). URL Manager Pro 3.1 was released in October, 2003. Shared Menus Enhancer also adds Shared Menus support to Firefox, Mail, Mozilla and Netscape. However, my advice is start using the Bookmark Menu Extra. Choose User Manual from the Help menu for an explanation between the two. The Shared Menus Enhancer module adds Shared Menus to applications which itself do not support Shared Menus. Currently, this module adds Shared Menus compatibility to Safari, Firefox, Mail, Mozilla and Netscape. More information is available here. When you have Safari's Debug menu enabled, it is possible that when rebooting Mac OS X and then launching Safari, the Diamond menu does not show. My experience is that quitting and relaunching Safari fixes this problem. URL Manager Pro's Shared Menus compatibility with web browsers is given below. However, my advice is to start using the Bookmark Menu Extra instead. See URL Manager Pro's Preferences/Menu Extra. This tabel lists the browsers that show Shared Menus in their menu bars. The row History in the table refers to the capability of URL Manager Pro to log your web browsing in that browser. *Note: You need URL Manager Pro 3.1 or higher, see first question above. Netscape and Mozilla Mac OS X only. **Note: You need to have the SharedMenus.component and Shared Menus Enhancer installed. With URL Manager Pro 3.0, the commands 'Share as Menu' and 'Disable Shared Menus' are gone. By default, the whole document is shared and you will see your whole hierarchical tree structure of bookmarks as as shared menus right next to the Diamond menu in your browser's menu bar. This menu has either the name of your bookmarks file or is the URL Manager Pro document icon, depending on the preference 'Use document icon instead of document title' in Diamond menu->Preferences->Appearance. To add a bookmark from the browser's menubar to a specific folder, use the command 'Add Bookmark' from one of the submenus of this bookmarks menu right next to the Diamond menu. On Mac OS X, however, instead you now have the commands 'Show in Dock' and 'Don't show in Dock'. This means you can 'share' your individual bookmark folders as popup menus via the Dock. For more information, open Shared Menus Help from the Help Center and click the Dock Menus link. What about Auto Start URLM? You do not need the Auto Start URLM extension anymore when using URL Manager Pro 3.0. If you find it in your Extensions folder, delete it and restart your Mac. OmniWeb 4.2 and higher support Shared Menus and URL Manager Pro fully. Opera and URL Manager Pro are fully compatible. URL Manager Pro 3.3 can also import Opera's bookmark files. For URL Manager Pro 3.1 and 3.2 users there is a tool, which can help you. Use OperaToHTML to convert Opera's bookmarks to HTML format. Then use the command Select Bookmarks File from the Import sub menu of the File menu in URL Manager Pro to import Opera's bookmarks. Please check first of your browser supports Shared Menus. Above is a table that lists all browsers. Please make sure you have the extension 'Security Manager' enabled. Perhaps you are mixing the URL Manager Pro 2.x and 3.0 versions? Do you see a file named 'SharedMenus.component' in your Extensions folder? If so, you need to run URL Manager Pro 3.0 only. If you see the file 'Auto Start URLM' in your Extensions folder and you are using URL Manager Pro 3.0, delete it. You do not need it anymore, because this feature is now handled by the Shared Menus Component. Remove the 'Auto Start URLM' file and restart your Mac. To auto start URL Manager Pro 3.0, choose Preferences from the Diamond menu and click the At Startup tab. Enable the preference 'Launch URL Manager Pro at startup'. URL Manager Pro supports aliases in the Startup Items and Cabinet folders and also supports aliases of the URL Manager Favorites and URL Manager History files, which are located the Preferences folder. Choose the About URL Manager Pro command from the Apple menu (Mac OS 9) or the URL Manager Pro menu (Mac OS X), press the 'Personalize' button, and enter your name and key. TIP: If you misplace your key or it does not seem to work, you can query your key from our database. The About item for Carbon apps (e.g., URL Manager Pro also) doesn't work if you're using FinderPop's (or BeHierarchic's) Hierarchical Apple Menu (Mac OS 9). You can this feature temporarily turn off via a checkbox in the FinderPop control panel's Behaviour subpanel. After you have entered your registration key succesfully, you can turn the option back on. Another option is to upgrade to CarbonLib 1.4 or higher. You can do that via the Control Panel 'Software Update'.